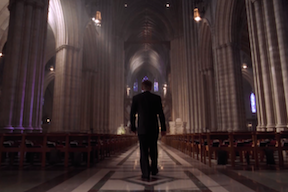 A friend of mine recently reminded me of the 2nd season finale of The West Wing: Two Cathedrals. After the death of a character close to the President, the funeral is held at the National Cathedral. I've never had a perfect appreciation of aesthetics– but this is one of the most beautiful buildings I've ever seen, inside and out. The building itself, equal parts temple and monument, this pristine house of God: it was the perfect setting for the President to address his outrage and grief… so I stole it.